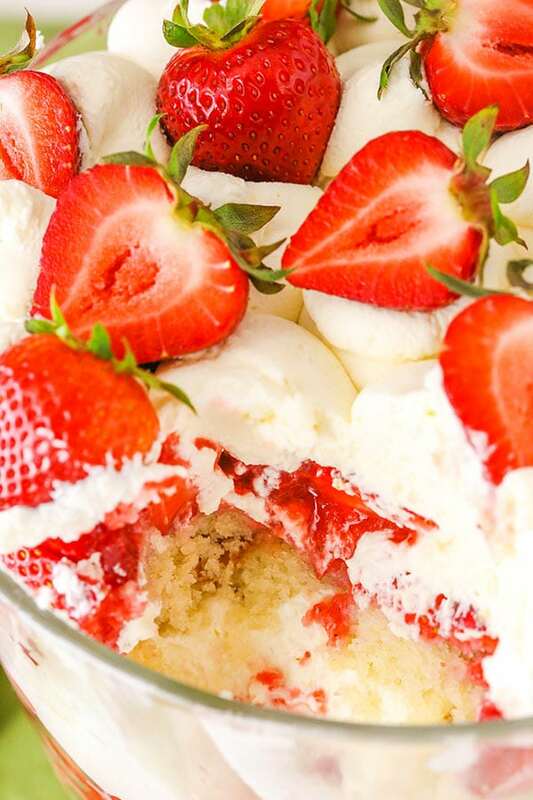 This Strawberry Shortcake Trifle recipe is simple to make with layers of moist vanilla cake, fresh strawberries, strawberry sauce & fresh whipped cream! It’s perfect for fresh Summer strawberries! So the boys are at the most fun age right now – 6 months. I imagine every stage could be a new favorite, but so far this one is a blast. The boys are so curious and sweet – smiling and laughing like crazy. They are sitting so well on their own, though a touch wobbly. And they are still little snugglers, which I’ll take all day long. The other morning, Ashton started mimicking the kisses I was giving him and gave me some big, drooly open-mouthed kisses for the first time. It was SO cute! This summer we’ve been going to the pool, going out and about now that they are more portable, and going for nice, long walks. We are even taking them to the beach for the first time next month and I cannot wait to see them in the sand and ocean for the first time! While I’m looking forward to some cooler weather as fall approaches, I’m going to be sad to say goodbye to the warmth and being outside. Before that happens though, we are going to enjoy as much of the remaining summer as we can. 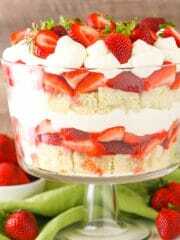 Why A Strawberry Shortcake Trifle? 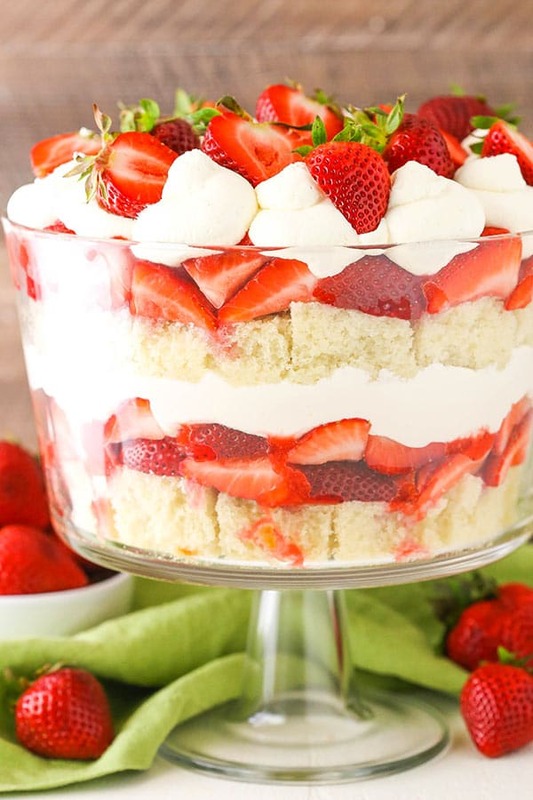 A Strawberry Shortcake Trifle combines two things that are perfect for the remainder of summer – strawberry shortcake and trifles! I love the delicious strawberries you get this time of year – I can eat them by the carton – and this trifle is FULL of strawberries! And when you combine them with cake and whipped cream in a simple-to-make dessert like a trifle, I’m totally sold! To make the trifle, I started with my Moist and Fluffy Vanilla Cake. It’s so tender, soft and fluffy and has such a wonderful buttery vanilla flavor. The cake has wonderful reviews and is a reader favorite! It’s perfect in this trifle. Next up is the strawberry sauce. You’ll puree about a pound of strawberries and combine it with some sugar and vanilla extract, then cook it over the stove to thicken it up a bit and bring out the flavor of the strawberries. It’s very similar to the strawberry sauce I used on my Strawberry Poke Cake and it adds great flavor and moisture. The cake and strawberry sauce are layered with freshly chopped strawberries and homemade whipped cream. The whole dessert is light, full of strawberries and just like eating strawberry shortcake in trifle form. This is my kind of strawberry trifle! Such a delicious, classic dessert! 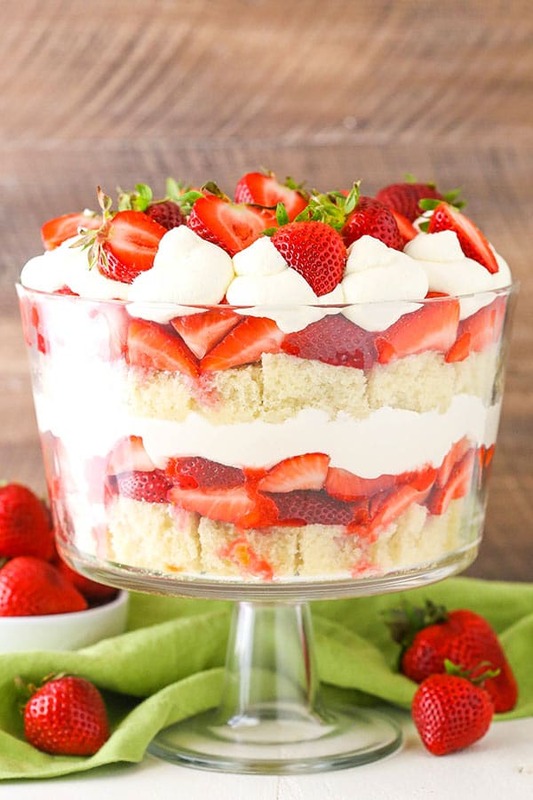 This Strawberry Shortcake Trifle is simple to make with layers of moist vanilla cake, fresh strawberries, strawberry sauce and fresh whipped cream! 1. Preheat the oven to 350°F (176°C). Grease a 9×13 cake pan. 3. Add the egg whites and vanilla and beat on medium speed until well combined and smooth. 4. Add about a third of the flour mixture to the batter and beat on medium speed until incorporated. 5. Add about half of the milk and beat on medium speed until incorporated. 6. Add another third of the flour mixture and beat until incorporated, scraping down the sides of the bowl as needed. 7. Add the remaining milk and beat on medium speed until incorporated. 8. Add the remaining flour mixture and beat until well combined, scraping down the sides of the bowl as needed. 9. Bake the cake for 35-40 minutes, or until a toothpick inserted in the center comes out clean. The cake will be browned on top. 10. When the cake is done, set aside to cool. 11. To make the strawberry sauce, add the strawberry puree, sugar and vanilla extract to a medium saucepan. Cook over medium heat until it begins to boil, stirring occasionally. 12. Allow sauce to boil for one minutes, then remove from heat and seat aside to cool. 13. When everything has cooled, make the whipped cream. Add the heavy whipping cream, powdered sugar and vanilla extract to a large mixer bowl and whip on high speed until stiff peaks form. 14. 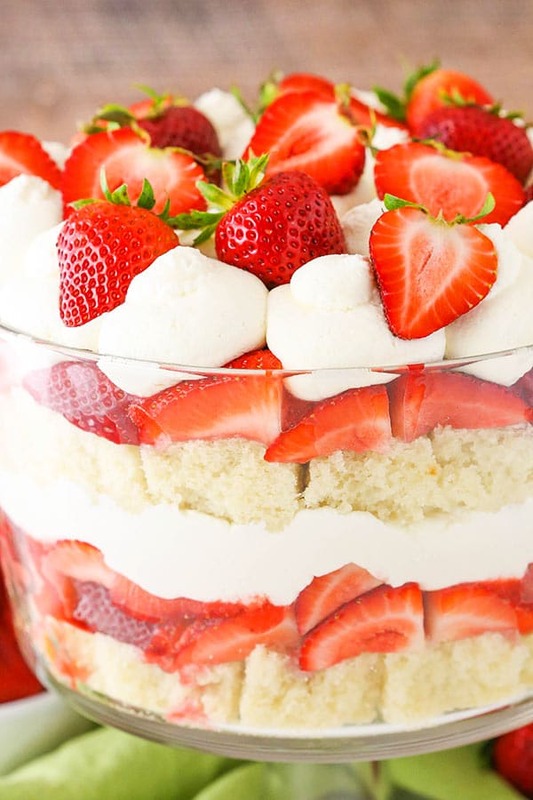 To layer everything in the trifle dish, add a layer of cake on the bottom, then about half of the chopped strawberries, about half of the strawberry sauce, then about half of the whipped cream. 15. Add a second layer of cake, strawberries and strawberry sauce, then pipe the remaining whipped cream on top in swirls. Add a few additional strawberries on top as decoration. Note: You may not need to use all of the cake for the trifle. Hi Lindsay, This recipe came at the right time. I just purchased a new truffle bowl and now I have something to fill it up with. We love strawberry shortcake so this will do just fine. 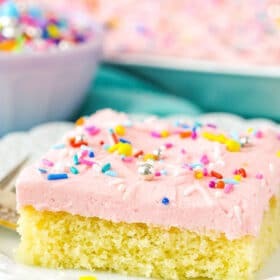 One question…….looking at the link to your Moist and Fluffy Vanilla Cake Recipe, I noticed that it does not list salt in the ingredients and this shortcake recipe does (1 tsp). Are both correct? Since peaches are prime right now in my area (and my cousin owns an orchard), do you think I could make a sauce using them instead of the strawberries? The last peaches we had, though ripe were quite sour (but I love that taste!) so I’m thinking the sauce may need a little more sugar. I would think that’d be fine – and tasty! I made this cake for my best friends 50th Birthday and it was a huge hit. The kids love everything chocolate so we had brownies as a backup but all the kids loved it and had had seconds. Thanks for sharing! 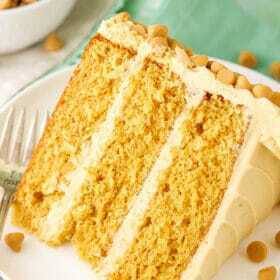 Beautiful and scrumptiously delicious looking. Gotta make! Yummy!!! Just wondering how soon from serving should the trifle be assembled. Can it be put together the night before or morning of an event? Does it ruin its presentation if done in advance and put in the fridge? If you make the cake the day before it should be okay. I would recommend refrigerating. You can, but generally speaking heavy cream (as opposed to heavy whipping cream) doesn’t hold it’s shape quite as well or for quite as long. How far in advance can I make this? Can I do it the day before and put it all together the next day? Definitely a day ahead would be fine.